Congratulations Philly Youth Poetry Movement! 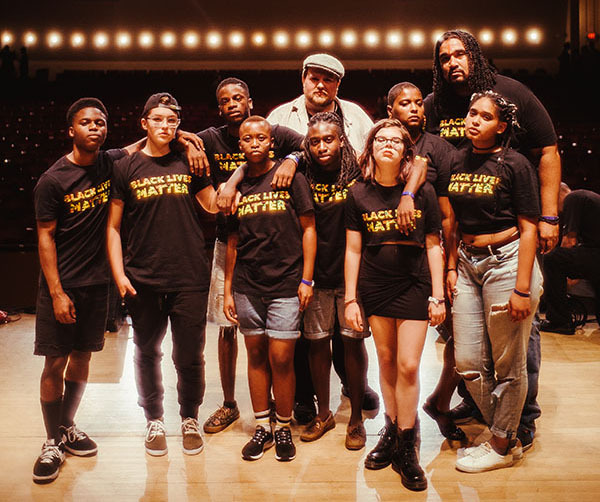 Brave New Voices 2015 (#BNV15) featured over 600 Teen Poetry Slam Champions from 50 parts of the country and 5 additional cities from across the globe, representing over 50,000 young poets in their local communities. These young writers convened at Emory University in Atlanta during July 15-18 not only to compete, but also to attend world-class workshops led by renowned poets and writers, participate in youth development programs, and highlight the voices of a new generation of leadership. From enriching dialogues on food justice, economic and gender disparity to wrenching and vulnerable poems exploring intergenerational trauma, joy in the face of oppression and the enduring legacy of slavery. #BNV15 provided young people the space to transcend borders, combat isolation, and cultivate collective knowledge. #BNV15 culminated in a powerful Grand Slam Finals at the historic Atlanta Symphony Hall, where poets from Philadelphia, Denver, Fort Worth Texas and Atlanta shared the stage to vie for the crown. After a long and powerful night, Philly Youth Poetry Movement was named the Brave New Voices Grand Slam Champion! Now YOU can re-live the excitement of #BNV15 right here! Each week we will release a new video featuring the transforming power of #BNV15. From prelims to late-night informal cyphers to semis and Grand Slam Finals, you can catch it all right here. We are starting this playlist with the sizzle reels of events such as Opening Night Ceremonies, Queeriosity, I Want To Live and Brave New Leaders, which give you a glimpse into the robust and dynamic programming that makes Brave New Voices stand out. Get a taste of #BNV15 Opening Ceremonies at Emory University where we officially kicked off the Festival by welcoming 600+ youth poets from across the world to Atlanta, GA! This powerful event featured performances by Atlanta Youth Ensemble, “I Want To Live” poets, Future Corps, Atlanta Word Works and many more. Before we dive into the poetry, #BNV15 starts off with intimate Town Halls facilitated by prominent poets, educators and activists on urgent issues ranging from food justice, economic disparity and gender norms. This year, Niema Jordan of Off/Page Project (a partnership between Youth Speaks and the Center for Investigative Reporting) planned the Town Halls to be safe yet challenging spaces for youth participants to engage one another in meaningful dialogue. While #BNV15 is a youth-centered Festival, we create intentional spaces for our adult chaperones to receive professional development. Brave New Voices is more than a festival, it is a Network of leaders in the fields of youth development, arts education and performing arts who are building and maintaining local non-profit organizations on tight budgets and big dreams. We come together to share resources, skills and wisdom to strengthen the work when we go back to our respective communities. Every year, Queeriosity is one of the most lively performances at Brave New Voices. A safe space for all queer youth to get free on the mic, it is a true testament to the bravery and creativity the youth cultivate during the Festival. At Opening Ceremonies, we launched our latest campaign “I Want To Live” which gives youth of color a digital platform to tell their personal stories of experiencing racial profiling and police violence. Before Brave New Voices, we held local competitions around the country and invited the winners to perform at #BNV15. In addition, the 2015 Bay Area MC Olympics Champion Amari Chatmon created an “I Want To Live” rallying song, which he shared at Opening Ceremonies to encourage other youth of color at the Festival to share their stories and join the conversation. Before Town Halls, we held a morning plenary between Niema Jordan of Off/Page Project and American civil rights activist DeRay McKesson to discuss everything from social media activism to self-care to the role of youth in the fight for justice. At the end, the conversation opened up to include audience questions from #BNV15 participants and proved to be both enriching and motivating for everyone. Beyond the competition and formal events, Brave New Voices is notorious for cypher culture. Whether poets are eating lunch, en route to a slam or hanging out in the dorms, they can be found freestyling in circles - spontaneously exchanging beats, raps and songs. We don’t say “bringing the noise” for no reason. This year, our Media Team conducted interviews throughout the Festival to give you access to the moving and diverse testimony from staff, poets, chaperons and alum of the power of Brave New Voices. We asked a range of questions to get at the heart of what is unique about the BNV movement and what it’s impact is (at its best) on the world we live in.